From Goodreads ~ Emerson Knight is introverted, eccentric, and has little to no sense of social etiquette. Good thing he’s also brilliant, rich, and (some people might say) handsome, or he’d probably be homeless. Riley Moon has just graduated from Harvard Business and Harvard Law. Her aggressive Texas spitfire attitude has helped her land her dream job as a junior analyst with mega-bank Blane-Grunwald. At least Riley Moon thought it was her dream job, until she is given her first assignment: babysitting Emerson Knight. Riley has recently graduated from university and has landed a job at a large bank. Her first major assignment is to touch base with young eccentric millionaire, Emerson, and discuss his recent inheritance. A large portion of Emerson's wealth is in gold and he wants Riley to take him to the bank so he can see it. When they get to the bank, he discovers that his former contact at the bank has disappeared and Emerson has volunteered to find him. He asks Riley's boss to let her help him and against her will, she does. What they stumble upon is a possible theft of billions of dollars in gold and Emerson is determine to find it. 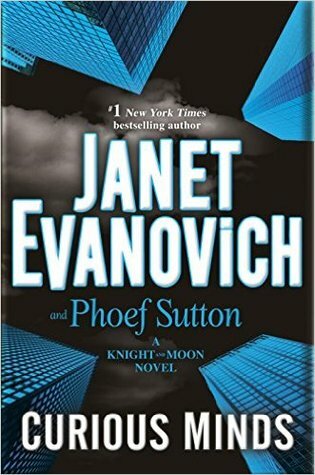 I've read many books by Janet Evanovich over the years (I especially enjoy her Fox and O'Hare series) and this is a new series she is starting with writer Phoef Sutton. I liked the writing style ... I found it flowed well and was a quick read. The story was a bit crazy but I went with it. It is written in third person perspective with the focus on wherever the action was. As a head's up, there was a bit of swearing. I liked Riley and Emerson. Both are intelligent but Emerson is a bit out there whereas Riley has had real world experiences (she grew up in Texas as the daughter of a sheriff). Emerson doesn't really catch on to sarcasm. I doubt he's had much experience with women. I liked the interaction between them and it was humorous at times. I liked the supporting characters (Emerson's aunt and cousin, etc.). I look forward to reading future books in the series.